This is the first year that we didn't spend Christmas with either of our parents. With living so far away, making that trip during the winter and so soon after we had just done it for Thanksgiving, wasn't something we are able to do. We were glad we were able to spend a good portion of time with both of our families during the time we were there. Being with them always brings a lot of joy. Especially seeing them love on Anna. Living in Utah hasn't completely left us without loved ones, though. Both of my mom's sisters, one of my dad's brothers, and Ty's brother live close. We are so lucky! Not long after we moved here, my Tante Karin invited us to their German Christmas dinner on Christmas Eve. I can't even describe how relieved I was. My mom's Christmas Eve German dinner is the highlight of Christmas for me every year. The thought of missing it was very depressing, so I was very prepared to accept. My Tante Ingrid even made Sauerbraten, in addition to the Schnitzel they already make, because I requested it. She's the best! It's just not a full German Christmas for me without it. (I confess I might have cried like a baby earlier that day thinking they might not have remembered. I'm ridiculous, I know.) I'm definitely loved. After dinner, we ate treats and my cousin's daughter read the Christmas story, another cousin read Llama, llama, Christmas drama, and we sang some Christmas songs. Then, we opened presents. Anna has been one spoiled girl this year. I can't say thank you enough for everything. It really made our Christmas special to spend time with my mom's side of the family. We came home full, happy and with lots of leftover Sauerbraten, Rotkohl, treats that Karin made, and plenty of gifts. It was past Anna's bedtime when we did get home so we quickly got her ready for bed once we got home. When she was in bed I got the meat ready for the next day's stew and then put out the presents. It was so pretty and made me nostalgic of Christmases growing up. That night's sleep was kind of rough. Anna woke up around 2:30, crying loudly. She doesn't do this often and usually calms down quickly. This time wasn't much different, except she took awhile to fall back to sleep. She kept kicking her mattress with her foot over and over and over and I was going crazy. She finally fell back to sleep after about an hour and a half and it took me another half hour or so to follow suit. When she woke up around 7:45, I was exhausted and didn't feel very excited about getting out of bed. We decided to take her into our room to do her morning routine (bottle and diaper change) so she wouldn't be distracted by the gifts. When we did take her out to the living room, her reaction was the best. She walked up to the display and said, "Oh Wow! Look at all the presents!" Perfect. If only I had had enough storage on my phone for the video. Opening presents with her was fun and once again, she was very spoiled. We even took out toys that she doesn't really play with anymore, earlier in the week and plan on donating. There's way more going in than coming out. She's a very lucky girl. Our plan for each other, this year, was to keep things pretty low key. We had decided on a couple of gifts. A movie, a bedding set, and something very simple for each other. (My gift to Ty was a Superman cape that I found on Clearance after Halloween. His gift to me is priceless. Getting up with Anna duty for the next four Saturdays so I can have a chance to sleep in.) Then, we decided that we really needed to get a new mattress because we weren't sleeping well at all and it was becoming a need. Ty was gifted the mattress that we had a few years before we were married and it was used then. The new one was delivered on Christmas Eve and I gave the delivery guys a very generous portion of Peanut Clusters as thanks. Before they took away our old mattress we saw just how bad it was and were glad to be rid of it. Once all the gifts were opened, we had Gingerbread pancakes for breakfast. I think this is a tradition I'm going to keep doing no matter where we are. So good! Later in the day, we Skyped with my parents and then Ty's brother, Nathan, his wife, Celia, and their crew of kids came over for dinner. It was so good to be with them. We really haven't been able to spend a lot of time with them the last few months and we love hanging out with them. After everyone had eaten and we started in on dessert, we Skyped with Ty's parents. Skype is such a great lifeline for us. We had such a great Christmas. 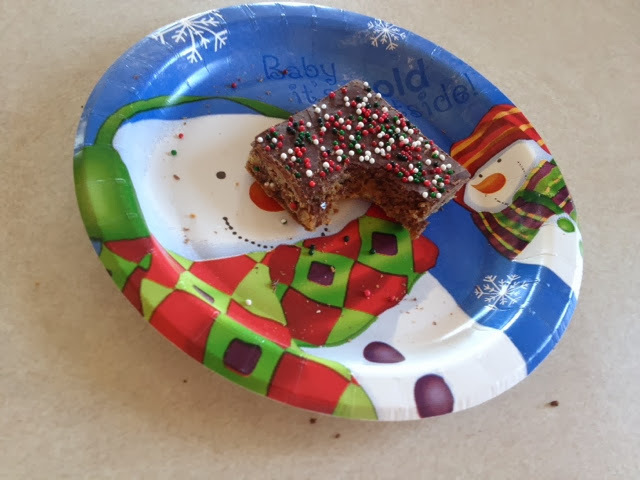 Even though we miss our parents, we both enjoyed not having to drive anywhere, being able to stay at home, and make our own family traditions. We hope everyone enjoyed themselves as much as we did and that you had a very Merry Christmas indeed! If you are like most people, this recipe probably won't appeal to you. My husband has a problem with most textures and tastes and doesn't care for it. Does that keep me from making it? Absolutely NOT! While making it this year, I realized that it's one of the things that signifies it's Christmas time for me. This German Gingerbread isn't like the American stuff you make houses out of or little men and women characters. (Honestly, I don't think Ty likes that either.) To me, its better. You can decide for yourselves. Last year, at the Relief Society Christmas dinner we were asked to bring our favorite Christmas treat. I had a little bit of a battle with this because obviously my favorite is the Lebkuchen, but not many care for it as well. So, I really made myself work and made Lebkuchen and some Peppermint cupcakes I'd been wanting to try anyway and brought both. At least two people asked me for the Lebkuchen recipe and I can't tell you how excited and happy that made me. I forgot to give that to them and so this is my way of making up for it. 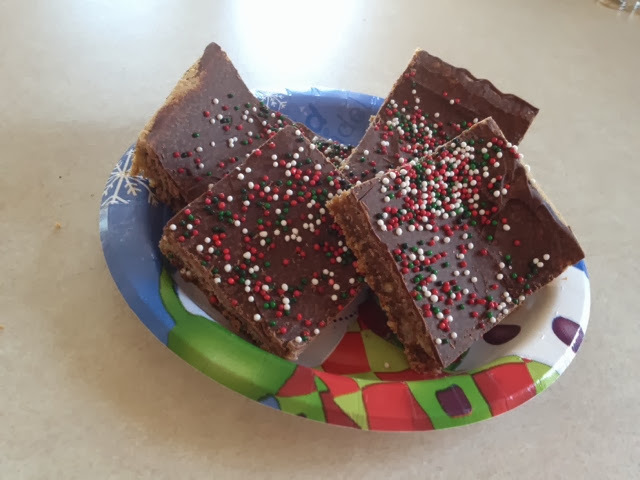 This is my mom's recipe that she cultivated after moving to the states and craving this yummy treat that made her think of home. A few years ago, I was determined to learn how to make it because it's something I hope to pass on to my children. I'll share the recipe, but also include a few tips that I learned. I wish I had some step by step pictures, but my kitchen is a disaster right now from all the treats I've been making. Seriously, I don't want to go back in there. It's too daunting. So I'm going to procrastinate that job by sharing this recipe with you. Win/Win. Except the kitchen. It definitely does NOT win. *30 seconds in the microwave should do. That's how long I did mine and I needed hot pads to get it out. **This should really read fine chopped diced orange peel. Diced orange peel is nearly impossible to find in a grocery store. I've only found it one time at the Food Pavilion in Moses Lake and now that store is gone. I finally did some Amazon searching and found some. This is the brand I use. To finely chop it, I would recommend a small food processor. I bought a cheap one last year on Black Friday. About half of a 8 ounce carton will be enough for one batch. Beat baking soda and honey until foamy. Cool mixture and add eggs, sugar, citron, flour, salt, cloves, cinnamon, ginger, orange extract, anise extract, and cocoa. Spread on a greased and floured cookie sheet. *** Bake at 350°F for 12-15 minutes. Brush with melted chocolate**** or a mixture of 1 1/4 cup powdered sugar, 1 can evaporated milk, 1 tsp. lemon extract. Cool and cut into bars. ***When you are spreading out the dough, you will want to have pretty wet hands. You will also have to continue to rewet them a few times. When it starts sticking to your hands that's the sign your hands are too dry. Just wash off the dough and shake hands a couple of times (you don't want them too wet) and continue. Also, DO NOT taste the dough. You will be tempted, but trust me. Anise is very strong and you will get a big taste of black licorice flavor in your mouth. Maybe that tickles your fancy, but not me. It will bake down in the oven so it's not nearly as strong, so don't worry about that. ****We are chocolate people, so that's what we always did. I don't remember trying it with the powered sugar mixture, but if you do please tell me how it is (though I have no doubt it will be yummy). If you make this, please comment and tell me how you liked it. Or if there are any questions, let me know. It's pretty simple and hopefully my tips will save you from learning anything the hard way. Enjoy all! I can't believe how fast the time has gone. And it seems like her first birthday was forever ago at the same time. It's amazing how fast kids grow. We just love her. The last few months have been crazy with the move and adjusting to Utah life. Anna has done really well though and never ceases to amaze us with how she progresses. I keep having to remind myself that she really isn't a baby anymore. She's a toddler through and through and becoming more of a little girl every day. I know we shouldn't compare her to other kids, but seriously, she's kind of a genius. She will constantly impress us and others with how well she talks and how intelligent she is. - She repeats EVERYTHING we say. And really well. She articulates her words so clearly. It's pretty easy to understand what she says. - She knows her basic shapes. Square, Triangle, Star, Circle, and Hexagon. She pronounces them all pretty well, but she does say circle more like, "Erkel" and it's hard not think she's referring to the Family Matter character. She also doesn't pronounce the "g" in triangle, but who cares. We have a little bucket with a lid that has holes for the square, triangle, circle, and star and she has figured out which one goes in which hole. - She counts to 13. No joke. Most of the time, she does seem to skip 5-7 for some reason, but she's getting the hang of it. Every once in awhile she'll throw out 18 and 19. I have no doubt she'll be counting to at least 20 by the time she turns two. Update!! She now counts to 20! Talk about impressive. - Since she was an infant we have been singing Primary songs, a few nursery rhymes, and the ABC's to her. Recently, she started singing herself and we were shocked to realize that she knew all the words to Twinkle, Twinkle Little Star and can sing it pretty well. She's pretty good at ABC's, but still needs a little work on some of the letters. That doesn't stop her from trying to sing it on her own. My favorite part of her singing that song is when she sings "Now I know my ABC's, next time won't you sing with me." Adorable. Most of the time when we sing Primary songs she'll just come in at the last word or so of the line, but she always knows what the word will be and is good about singing the tune. Update!! Her new favorite song to sing is Old McDonald Had a Farm. It's adorable! - She's doing pretty good with her colors and can say them very well, but we are still working on associating the color with the word. Update!! She now knows which color is which. So impressive how quickly she learns. - She knows so many different animals and does the sounds so well. My favorite is her impression of the gorilla. Ty's work is hosting a day at the zoo and I'm excited to take Anna to see all the animals she sees in her books, up close. She loved seeing the animals at Thanksgiving Pointe. Especially the cow who was mooing nonstop like she was irritated or something. - The list of words she says is too long and I really couldn't keep track. Her vocabulary is really extensive that if she starts whining (Hooray for Toddlerhood!) we tell her to use her words to tell us what she needs. This doesn't mean that she still doesn't have toddler jibber jabber, but she definitely throws a lot of understandable English around too. It's really hard to not think that this girl is a genius. I'm betting she'll be headed to college by 13. Sometimes, she says a word and I'll ask Ty if he taught it to her and he'll say no and thought that I did. It's amazing what she latches onto in passing. Though I do have to admit that I very pro Mickey Mouse Clubhouse. She LOVES that show and Mickey (she calls him Mo Mo or Ickey, I have no idea why) and I love that it will teach her good things and keep her occupied while I finish up chores. - Still has such a great temperament. She's, overall, a really happy girl. - LOVES to laugh and to make other people laugh. I think her favorite activity is laughing matches that she starts with people. Once you get her going and she thinks you have a funny laugh, it will go back and forth for awhile. She's trapped many unsuspecting victims into this fun trap. - Best. Teether. Ever. Not a peep. Nothing out of the ordinary. Just more teeth that happen to be growing inside of her mouth. No big deal. May the Lord see fit to bless me with children who are all this good with teething. Amen. - She is way too tall for my own good. She can reach the top of the counter now and will start grabbing things off of it. I do not enjoy this, but I suppose I have to adjust. - She loves to build and destroy towers with her cardboard blocks. Lately, she'll start yelling, "TOWER! TOWER! ", if she wants to get started. - She's started taking an interest in Potty time and we're planning on getting a little one for her to start getting used to the idea for herself. I'm definitely looking forward to not changing diapers anymore. - One of the things she started to say is, "Oooooh, cute." I'm sure it's a mimic of us saying it, but when she says it it's so much more adorable and it makes us both happy every time. - Check out her lovely little locks! I love how much they've grown and how curly they are. I hope those curls stick around forever. They're too darling. - She loves the new Goldfish Mac & Cheese. She devours it. I was actually really surprised, though maybe I shouldn't have been. She loves her regular Goldfish and will snack on them as often as she can. - Eating is getting a bit easier, though she's still unfailingly picky. She does like potatoes in any fried form, but no other. Apples, pears, grapes. Goldfish, as previously mentioned, but not real cheese. Corn, on the cob, off the cob, or popped. Most breads. Chicken nuggets, but not any other kind of meat. Really anything green is completely out of the question. She has tried, but just doesn't care for it. Yogurt is a staple and, of course, milk. - Her kisses are the best. She'll give you one and then say, "Muah!" I love that she's becoming more free with them for us. She's also starting to cuddle more and I just love it.